If you would like to purchase any of these posters then just send me an email with your address and name/quantity of the posters you would like. To email me please click the Contact link in the top menu bar. Posters are printed in A1 format 23.39 x 33.11 inches (59.4 x 84.1cm) on high quality 200gsm glossy paper and are shipped rolled in a strong cardboard tube. Once you place an order I send you a simple PayPal request for payment, or if you are in New Zealand you can deposit direct to my NZ bank account. If you would like to purchase this poster then please see the ordering process above. Also check out how awesome these posters look on the wall. 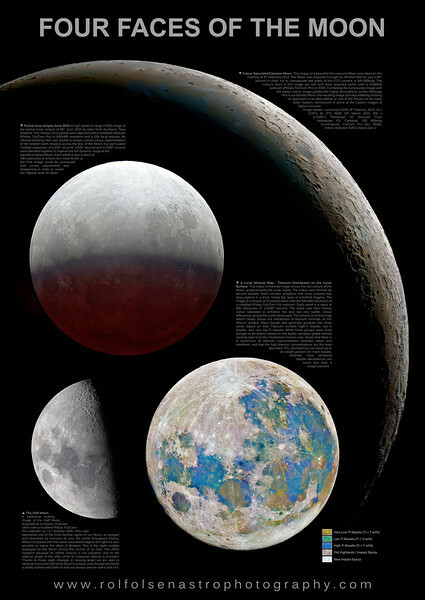 This poster features four very different views of the Moon all with detailed descriptions, taken from my observatory in Auckland, New Zealand.